Roughly chop the onion and soften it in a little extra virgin olive oil. Add the beans, brown them in the oil for a few minutes, add boiling water and salt and pepper to taste. Cover the pan with a lid and cook over a low heat for a least an hour. When the beans are fully cooked, purèe them in a blender. 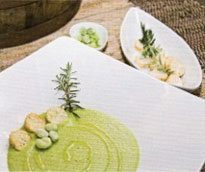 Drizzle with olive oil and serve with croutons. Cut the aubergine into 1 cm â thick slices. Place them in layers in a colander with salt. Put a heavy weight on them and leave them for an hour to remove water. Sieve the tomatoes to make tomato passata. Put the garlic in a casserole with a bit of oil and fry until it turns golden. Add the tomato passata, a pinch of salt, a few basil leaves and let everything cook for about ten minutes. Fry the aubergine slices in plenty of oil and remove excess oil with kitchen roll. Put the slices in the sauce and cook them for five minutes. Cook the pasta. Once cooked, drain it and toss it for a few seconds in the casserole with the sauce. Serve the pasta, add the sauce to each plate and grate plenty of salted ricotta over everything. Place the ricotta in a bowl with the pistachio powder, salt and pepper. Using a fork, mash the ricotta to a smooth paste. In the meantime, prepare the sheet of pasta. Place spoonfuls of the filling on the sheet and form the ravioli. Clean the cuttlefish and put the ink sacs to one side. Brown the chopped onion and garlic in olive oil. Add the cuttlefish, cut into strips, add the whole prawns. After a few minutes, pour in the wine and let it evaporate. Finally, add the tomato purée diluted in half a grass of water, salt and the ink from the sacs. Reduce a little, then add a ladle of stock. Cover and cook over a medium heat for about 30 minutes. In the meantime, cook the ravioli, drain and add them to the sauce. Soak the capers in water to remove excess salt. Finely chop the olives, capers and onion on a chopping board. Fry lightly in a frying pan with some oil . After 5 minutes add the tomato passata and cook for about half an hour. Cook the spaghetti and drain it, add to the sauce. When they are well mixed, place the spaghetti onto tin foil and create little birdâs nests on the foil. Add the remaining sauce on top, wrap each nest individually and cook them in the oven for a few minutes.